Students, staff and community members are excited about the reopening of the Warwick Valley High School pool, which now looks better than ever. After an extensive renovation and repair project, the vintage 1955 pool is now open for varsity swim and dive team practices and meets, as well as physical education swim classes. On Monday, October 1, 2018 the pool will open for community Lap Swim and Family Rec. Swim programs – see the schedule below. 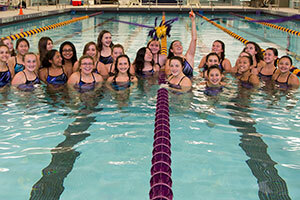 Team members, district administrators and those involved with the project celebrated at a ribbon cutting ceremony held at the pool on September 21, before a swim meet against Washingtonville High School. 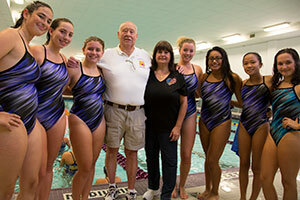 The “Anthony C. Quinn Memorial Pool” is named after the late son of longtime WVHS swim coaches John and Antoinette Quinn. Due to the priority of other district building & grounds projects, little work had been done on the pool since it opened over 60 years ago. Once the project began, several unexpected issues were encountered, resulting in extra work and schedule delays. Additional fixes involved extensive pipe and valve deterioration, replacement of walls in both locker rooms, severe settling under the pool deck, replacement of deck drains, replacement of the main shutoff valve, deterioration of the pool foundation under the pool, leveling of the pool deck, and replacement of missing tiles and grout in the pool interior. The pool renovation, a district capital project, began last spring and was completed this month. “Now that all the work is done, we basically have the equivalent of a new pool,” said Mr. Timothy Holmes, Assistant Superintendent for Business.